We often represent and defend federal employees in proposed disciplinary actions. When a federal employee is facing proposed discipline it is important for them to speak with an attorney knowledgeable in federal employment law for legal advice and representation. This article outlines some key points for federal employees as they respond to proposed disciplinary actions. 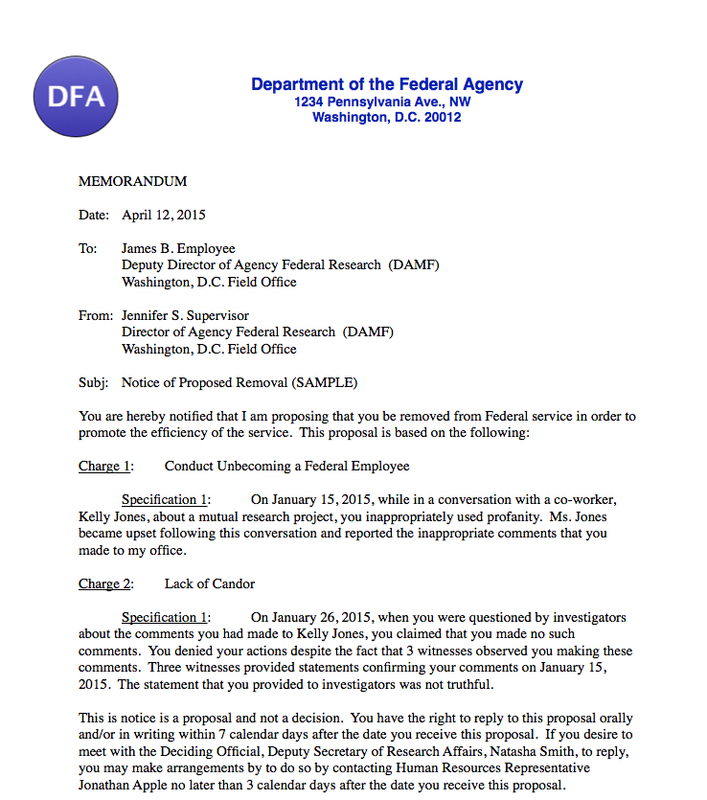 We have also drafted a Sample Proposed Action, a hypothetical proposed removal, so that federal employees can better understand how a disciplinary action starts. Most proposed disciplinary or adverse actions for federal employees generally fall into 3 general categories for federal employees: (1) proposed suspension or demotion actions based on misconduct; (2) proposed removal actions based on misconduct; and (3) proposed removal actions based on performance deficiencies (i.e. the failure of a PIP). There are other types of disciplinary actions, but these generally constitute the majority of the types of proposed disciplinary actions that a federal employee might face. When a federal employee receives a proposed disciplinary action (suspension of 14 days or less covered under 5 C.F.R. § 752.203) or an adverse action (suspension of over 14 days to removal covered under 5 C.F.R. § 752.404), they should read over the document very carefully. Each federal agency sets their own particular deadlines for submitting a response and these deadlines are generally strict. Generally, each proposal for discipline will list the time limits for requesting the evidence file, requesting an oral response and for submitting a written response. Some agencies may include other additional deadlines as well. It is important to pay close attention to each deadline as an employee can lose the right to contest a proposed disciplinary action if they allow a time period to expire without taking action. A federal employee can also request an extension to respond to the proposed discipline, if necessary. Extensions are granted in many cases, especially if there are good reasons for the request (i.e. the individual needs to consult with an attorney, the investigative file provided is extensive, etc.). Along with a copy of the proposed discipline, when it is issued, the federal agency may provide an employee a copy of the materials in the evidence file (documents, reports, emails, recordings, video, photographs, etc) that they are relying upon in proposing the action (often referred to as the “information relied upon.”). Many federal agencies, however, will not provide the materials along with the action to the employee, but will indicate in the proposed action that they can be requested or reviewed within a certain number of days. It is critical for a federal employee to request and obtain these materials prior to the written and oral response stage. It is also important for a federal employee to not only submit a comprehensive written response, along with documentation (affidavits, character letters or other evidence) refuting the charges and specifications or in providing arguments for mitigation, but also to request an oral response. I have found that it is much easier for the decisionmaker, referred to as the Deciding Official, to make an adverse decision for the federal employee if they are just reviewing a paper submission. Requesting and then presenting an oral response adds an important personal aspect to the response. While this may be uncomfortable to do, it is important to request an oral response. The written response to the proposed disciplinary action should address all of the allegations raised in the proposed discipline, in addition to providing records of the employee’s good performance/work record, and other positive attributes for use in potential mitigation of any penalty. Typically, these submissions can run anywhere from 5 to 100 pages (inclusive of exhibits), but are very important and form the basis of the federal employee’s legal defense. While it is very important to both rebut or respond to the allegations, it is equally important to make arguments under the Douglas factors for purposes of mitigation of the penalty (e.g. reducing a proposed removal to a suspension). The purpose of mitigation arguments is to focus on why the federal employee, even if some or all of the charges are true, should receive a less harsh penalty. In addition, the oral response presentation by the federal employee and his or her counsel should be straightforward and to the point. An oral response generally lasts anywhere between 30 minutes to an hour and a half depending on the nature and number of allegations made and the mitigation arguments that need to be presented. A federal employee should generally not repeat or read from their written response, but rather highlight key arguments to the Deciding Official as to why the action is not warranted and to focus on potential mitigation arguments. If there is a key argument, it can be helpful to focus in on that point during the oral response. We believe that oral responses in proposed disciplinary actions are important. In addition, some Deciding Officials (roughly half of them) like to ask questions about the allegations in the proposed discipline to the federal employee. Sometimes, the federal employee is asked questions by an agency attorney or Human Resources official during the oral response. If the federal employee is prepared to respond (i.e. prepared by their attorney), I often recommend answering these questions because it can help to potentially mitigate discipline when done so appropriately. It is also helpful for the federal employee to present their response in a manner that is not defensive. When we represent federal employees during the oral response stage, we generally lead the federal employee through the oral response, outlining their legal defenses at the beginning of the response and then focusing the employee on explaining the key factual allegations as we respond to the charges and specifications. Having counsel at the oral response is extremely important for a number of reasons. It enables a federal employee to have a strong voice prior to a decision being carried out. Generally, in our experience, when a federal employee is not represented, Deciding Officials seem to take such responses less seriously. It is often the case that a proposing official will prepare their assessment of these factors to present, along with the other evidence, and provide them to the Deciding Official. Management will usually present an analysis of each factor and determine whether it is aggravating (should be considered against the employee during the penalty phase), mitigating (should be considered in reducing the employee’s penalty) or not applicable. It is the job of the federal employee or his or her attorney to present the employee’s arguments under these Douglas factors. While each case varies, some of the more common Douglas factor arguments involve Factor #4, which involves a federal employee’s past work record (years of service, performance ratings, commendations, etc) and Factor #9, lack of training in cases involving violations of rules. Many other of these factors can apply, depending on the case and the federal employee involved. Following the response stage, the Deciding Official will eventually issue a final decision on the proposed discipline. The time period to receive a final decision varies significantly, usually anywhere from 1 week to 12 weeks, but can take longer than this. The average wait time for most federal employees seems to be about 4-6 weeks, but can vary quite a bit. Usually, when the decision on the proposed discipline has been made the federal employee is called into the Deciding Official’s office, or scheduled for an appointment, and given a copy of the decision, along with a description of any appeal rights in the decision. They are then asked to sign for a copy of the decision, which is usually just to demonstrate that the action was delivered and received. Sometimes, federal employees believe that they are being asked to sign the document in agreement of the allegations and that is generally not the case. It is important for a federal employee to consult with an attorney because it can often be the case that the federal agency does not list all of the available appeal rights available and an employee may miss some rights that they have should they need to appeal the final decision by the Deciding Official. Depending on the severity of the discipline issued by the Deciding Official, along with the underlying basis for it, a federal employee may have one of more avenues to appeal. Some federal employees may be able to take a disciplinary action on appeal to the Merit Systems Protection Board (MSPB), through the grievance/arbitration procedure, through the Equal Employment Opportunity (EEO) process, or perhaps file a whistleblower defense. Our law firm represents federal employees before the MSPB and in other venues. There are additional avenues for appeal beyond these. However, it is important to consult with legal counsel as early as possible because it is often the case that when an employee elects one type of appeal, then he or she may not be able to pursue another type later. When a federal employee or federal supervisor is facing a proposed disciplinary action it is important to obtain legal advice and representation through experienced counsel. Our law firm advises and represents federal employees and supervisors throughout the country. We can be contacted at www.berrylegal.com or by telephone at (703) 668-0070. You can also visit our Facebook Page here. This entry was posted in Adverse / Disciplinary Actions and tagged Deciding Official, Douglas factors, Douglas v. VA, federal employee attorneys, federal employee lawyer, federal employee lawyers, Federal employees, federal employment law, information relied upon, lawyer for federal employees, materials relied upon, mitigating factors, oral response, performance, PIP, proposed discipline, proposed removal, Reduction of Penalty, responding to proposed discipline by berrylegal. Bookmark the permalink.